Australia has been a leader in international education for many years, and it is now the country’s principal services export and our third largest export industry overall. It has been identified in any government and other studies as an industry with strong growth potential. While Western Australia continues to see growth in international student enrolments, the states’ share of overall international enrolments to Australia has declined. 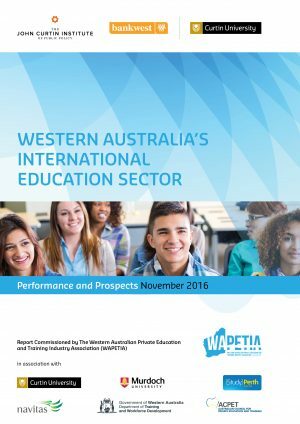 This report outlines the performance and prospects for WA’s international education sector. We analyse trends in international student enrolments across the main sectors including higher education, VET, ELICOS, schools and non-award. Key source countries for WA are reported on, and we compare WA’s source country concentrations to that of other states. The value-added contribution of international education to WA is presented, and scenario analysis explores potential future growth trajectories. Economic modelling shows the importance of various macroeconomic push and pull factors that determine student choice of destination. sponsors for their invitation to undertake the research for this report.